Bolton Wanderers have announced that Manchester City midfielder Martin Petrov will join the club on a free transfer on 1 July. The 31-year-old was out of contract at Eastlands and was told in June that he would not be offered a new deal by manager Roberto Mancini. Left-sided Petrov was signed by former City boss Sven Goran Eriksson from Atletico Madrid for £4.7m in 2007. 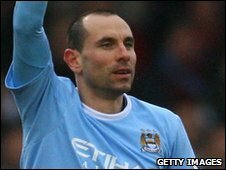 The Bulgarian international made 66 appearances for City, scoring 12 goals. Petrov, who was Bulgarian Footballer of the Year in 2006, has previously played for German club Wolfsburg. He has also made 77 appearances for Bulgaria, scoring 19 international goals.